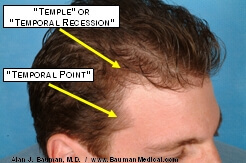 The “Temporal Point,” located between the temporal recession and the sideburn, is an often overlooked area when it comes to hair restoration. 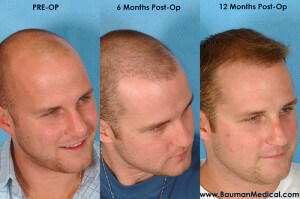 Dr. Bauman believes that appropriate temporal point restoration should be addressed in nearly EVERY hair transplant procedure. 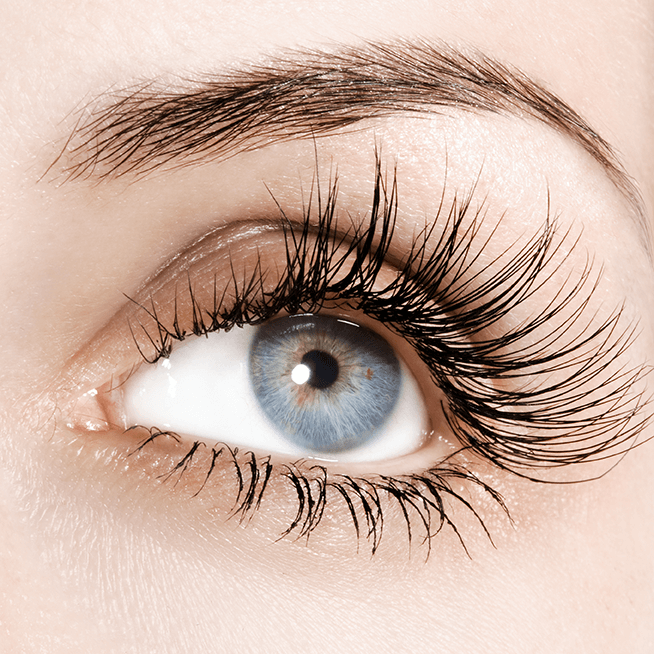 Whether it be to simply reinforce the area or reconstruct it completely, there is a significant improvement in the overall aesthetics of the procedure when this area is addressed appropriately. The shape and density of the temporal point should be ‘in balance’ with the frontal hairline. The temporal point is an extremely difficult area to design and transplant effectively. It requires specific combination of artistry, skill and instrumentation in order to ensure a completely natural result. 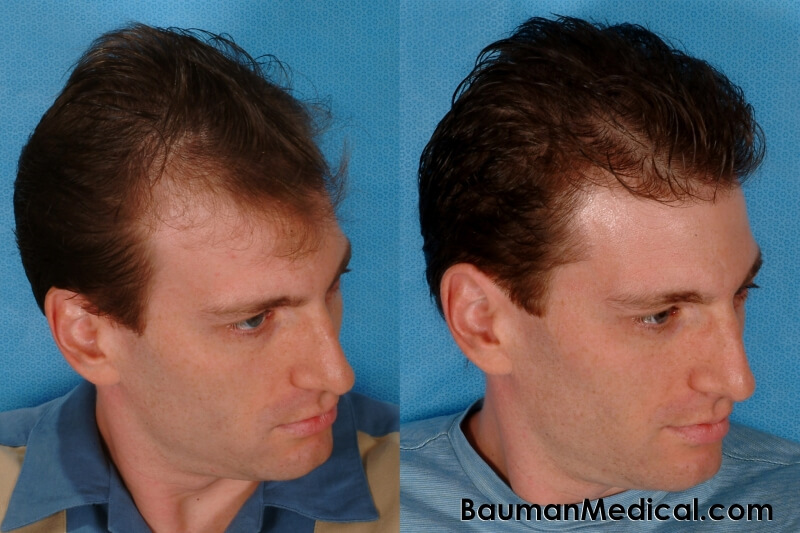 To follow are a series of before and after photos that show an example of patients before and after hairline and temporal point restorations by Dr. Bauman.Patient “K.S.“ had hairline and temporal point restoration using approximately 2400 follicular-unit grafts. 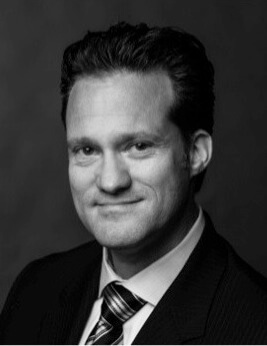 A close-up photo of K.S. showing the right side of the hairline and temporal point restoration 12 months after his hair transplant procedure. Note the natrualness of the shape of the hairline as well as the angle, orientation and position of the tranplanted grafts which yield a 100% undetectable restoration. 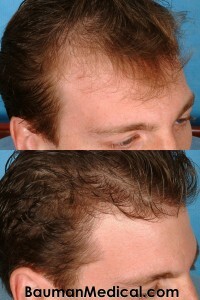 Case Presentation: Patient “A.G.“ before and after frontal hairline and temporal point restorations. 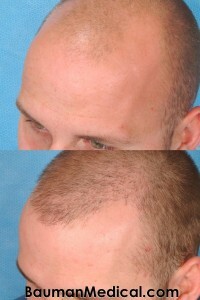 Note the hairline shape and the density achieved with a single session of approximately 2400 follicular-unit grafts. 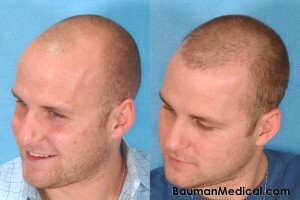 This patient “MB” had temporal point restoration in conjunction with his frontal hairline restoration. 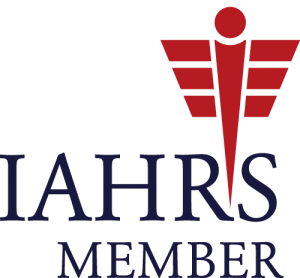 The temporal point should be balanced in proportion with the frontal hairline to give the most natural hair transplant results. 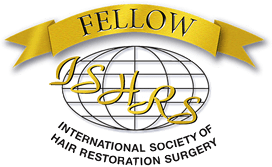 Temporal point restorations don’t require many grafts, so they can even be used for patients with poor donor who wear hairpieces to make their hairpieces more balanced and less obvious. This is also true of patients who have had old-style transplants that neglected the temporal point area.